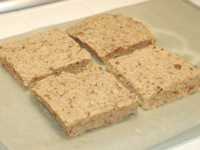 This recipe is an ideal use for stale bread and because most of the work is done advance it provides a quick hot breakfast. 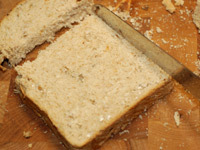 Cut the bread into ¾ inch slices and remove the crusts. Mix all other ingredients except the peaches in a bowl and whisk with a fork. 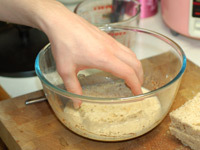 Dip the bread into the mixture and gently soak both sides, the mixture should be almost gone after dipping the forth piece. Cut the edges of a freezer bag (or any thick plasic food bag) to form 2 sheets of plastic. Place the bread on the plastic sheets and wrap them around the bread this allows each slice to be removed from the freezer one at a time. Put in a sealed freezer bag and freeze over night. 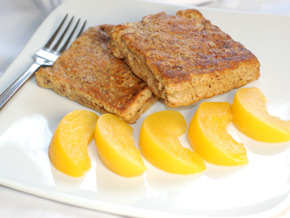 When you are ready to eat the toast, place the bread under a hot grill for 3 minutes on each side and serve with peaches.